September 13, 2015 – Budapest, Hungary: Migrants are seen at Keleti Central Train Station. Hungary’s border with Serbia has become a major crossing point into the European Union, with more than 160,000 access Hungary so far this year. 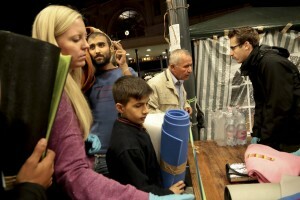 September 12, 2015 – Budapest, Hungary: Migrants receive aid in Keleti Central Train Station. Hungary’s border with Serbia has become a major crossing point into the European Union, with more than 160,000 access Hungary so far this year. 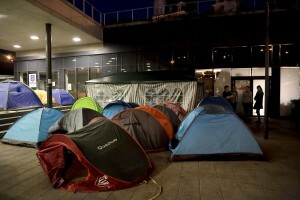 September 13, 2015 – Budapest, Hungary: Migrants rest inside tents at Keleti Central Train Station. Hungary’s border with Serbia has become a major crossing point into the European Union, with more than 160,000 access Hungary so far this year. 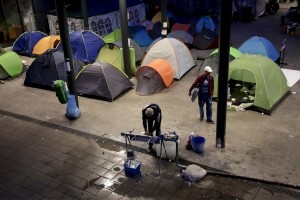 September 12, 2015 – Budapest, Hungary: Migrants spend the night inside Keleti Central Train Station. Hungary’s border with Serbia has become a major crossing point into the European Union, with more than 160,000 access Hungary so far this year. September 13, 2015 – Budapest, Hungary: Migrants take the train to continue their route in Europe at Keleti Central Train Station. Hungary’s border with Serbia has become a major crossing point into the European Union, with more than 160,000 access Hungary so far this year. September 13, 2015 – Budapest, Hungary: Migrants take a selfie inside the train to continue their route in Europe at Keleti Central Train Station. Hungary’s border with Serbia has become a major crossing point into the European Union, with more than 160,000 access Hungary so far this year.